I read this article and found it very interesting, thought it might be something for you. The article is called Housework Keeps India’s Women At Home. Some Women Are Changing That and is located at https://archive.indiaspend.com/cover-story/housework-keeps-indias-women-at-home-some-women-are-changing-that-78260. 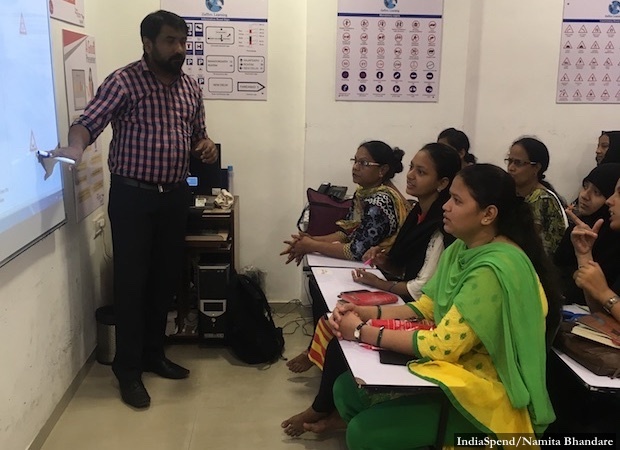 Women listen to Nikhil Kalelkar, a trainer for two-wheel riders, at Heydeedee, a start-up that describes itself as ‘India’s first all-women instant parcel delivery service’. Next week, they will be taking an online test, the first step towards getting a learner’s license, the first step towards driving their own two-wheelers, the first step, hopefully, to financial freedom and a vocation. “Sir, I’m terrified of animals. I will simply stop,” said 20-year-old Shweta Jadhav, her hair pulled back in a neat plait. It’s the wrong, if honest, answer, and 20-odd women erupted in laughter. Next week, they will be taking an online test, the first step towards getting a learner’s license, the first step towards driving their own two-wheelers, the first step, hopefully, to financial freedom and a vocation. There’s never a quiet moment at the Heydeedee office in Mumbai’s Madhu Industrial Estate. If one batch of students is preparing for their learner’s license, another lot is on the two-wheeler simulator and a third group is out on a deserted stretch of road getting a feel of their scooter and the road. Heydeedee trains the women for 45 days. At the end, it gives women–at least those who are interested in taking the class further–an offer letter that enables them to get a bank loan to buy their own two-wheelers. With the appointment and the scooter, they’re ready to roll. It might seem like a no-brainer. Learn to drive and get a vocation in the bargain. Every stage is a hurdle. The first stage is mobilising the women to join the class. “Most of the women we are seeking to recruit come from very traditional backgrounds where the girls are keen to work but their fathers or in-laws will not allow it,” said Kavita Chandekar, one of Heydeedee’s two mobilisers. whose job it is to get women to sign up for the class at a subsidised fee of Rs 1,500 (the idea of a token fee, said Roy, is to ensure that the women take it seriously). It doesn’t help that driving a two-wheeler professionally as a delivery person isn’t a traditional skill for women unlike, say, the beauty trade or healthcare. The next hurdle comes after the women decide to join but have to figure out the nitty gritty of their routines: Who will pick up the kids from school, how do you juggle a two-hour class with cooking lunch and dinner and washing and cleaning? “I cook once in the morning and then again in the evening because my husband will not eat left-overs,” said Suvarna Santosh Ghate, 38, a housewife who has never had a job and wakes up at 5 am to get her routine of chopping-cooking-cleaning-washing going. “Between 2 and 4 pm is my rest-time and so I am coming for class during this time,” said Ghate. Does her 15-year-old son, an only child, help her with the housework? All over the world, 75% of unpaid work–childcare, caring for the elderly, cooking, cleaning etc–is done by women, found a 2015 report by the McKinsey Global Institute. If this work could be valued, it would be worth $10 trillion of output per year (or equivalent to 13% of global GDP). India has one of the world’s largest gender gaps in unpaid work: Five hours or 351.9 minutes a day for women and 51.8 minutes a day for men, according to data available at the Organisation for Economic Cooperation and Development. This anomaly reflects, unsurprisingly, in the amount of time men and women spend on paid work: 184.7 minutes for women; 390.6 minutes for men. Nearly half of the women and girls surveyed in Bengaluru, Hyderabad and the National Capital Region in a July 2015 United Nations Development Programme study said that domestic chores and responsibilities were a barrier to their workforce participation and aspirations. Families are supportive of aspirations as long as they don’t come in the way of fulfilling their domestic responsibilities, found the study. Mumbai was an exception to this trend where only 30% reported domestic chores as a barrier. The inordinate burden of domestic chores that falls on women and girls in India might explain why they have been dropping out of jobs consistently since the post-liberalisation years. Between 1993-94 and 2011-12, India’s female labour force participation (FLFP) fell by 11.4% from 42.6% to 31.2%, according to an April 2017 World Bank report. In 2013, India ranked 120 of 131 countries surveyed for FLFP by the International Labour Organization. IndiaSpend has been tracking this decline in a special series of stories and ground reports here and here. More Indian women would seek employment if they found reliable caregivers, IndiaSpend reported on August 7, 2017. A survey of women in Rajasthan’s Udaipur district found that mothers with children in the one-to-six-year-old age group spent 9.4 hours a day on household chores. Feminist economist Ritu Dewan argued that if you take into account the unpaid labour of women, then FLFP will in fact overtake that of males by six percentage points. “Women work much longer hours than men. Much of it is invisible work including the free collection of common goods like firewood, water etc,” she said. There is collusion between the state, the market and the family to control the labour of women in various ways. “Patriarchy upholds a particular form of family that ensures cheap reproduction of labour with women as a ‘reserve army’ by supporting a form of household in which they continue to provide unpaid services,” she said. It was that cab driving experience–‘the tips were great’, grins Roy–that led her to start Asia’s first all-women’s taxi service in 2007. That partnership ended in 2009, and now Roy is driving change, again with an all-women set up. 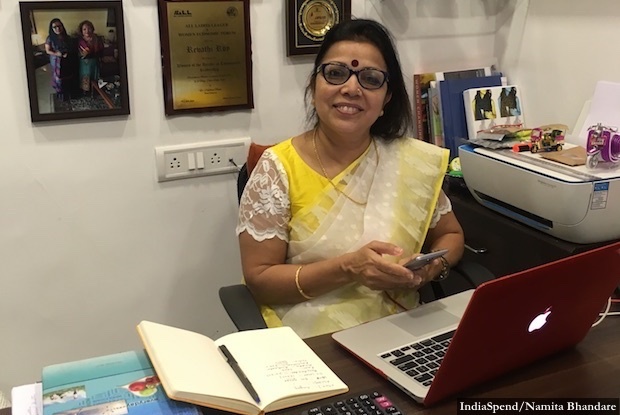 “I’m not giving women a hobby but a skill that will enable them to earn and support their families,” said Revathi Roy, CEO and managing director, Heydeedee. The one word I hear a lot from the women who complete the training, which includes not only how to drive a two-wheeler, but basic English, hands-on computer knowledge and softer skills in professional etiquette, is ‘majboori’ (compulsion). “Majboori hai,” said Jyoti Thakur, 38, who has at different times of her marriage had different careers from home tiffin maker to garment packer. “How can you manage on one person’s salary?” Her daughter, an only child, studies in the first standard in a convent school. The fees alone: Rs 1,800 a month. Plus, there’s private tuition for another Rs 800 a month, because, the eighth-class pass mother said she cannot help her daughter with schoolwork. Dressed in a striped t-shirt and jeans, Thakur completed the training and worked for six hours a day delivering parcels and food for Heydeedee but quit because the work was sometimes just too hard. “I want nearby routes but sometimes I would have to go for a delivery really far away. I would get lost. On some occasions I had to ask my husband to accompany me,” she said. Kulkarni now works as a trainer with Heydeedee, helping other women learn to navigate the road and the workplace. At Rs 15,000 a month and fixed hours of work, it’s a good job even though the commute to central Mumbai from Thane takes a couple of hours each way. Like Kulkarni, Vaishnavi Lalita Rakesh is a young widow. Her husband was killed in an accident, leaving her with one daughter and another one, not yet born. “I couldn’t stay at home. I needed to educate my girls,” said Rakesh who earlier tried stitching but found it simply didn’t pay enough, then heard about the programme at Heydeedee and signed on. The work is steady, she said. Her mother helped with the daughters while a younger brother also chipped in by taking them for their tuition classes. “I wouldn’t be able to work at all, if they didn’t help,” said Rakesh. Seated outside the Brijwasi sweet shop in Worli, Rakesh waits patiently for an order. When it comes–250 gm of dhokla, 250 gm of khandvi, 250 gm of patra and two pieces of ghevar–she springs into action, strapping her helmet and carefully guiding her Honda Activa down the short ride to the RBI residential colony at Prabhadevi. There is no tip on this day, but on most days people do leave her with a bit extra, once they’ve got over the initial surprise of their parcels being delivered by a woman. This is the third part in an ongoing nation-wide IndiaSpend investigation into India’s declining female labour force participation.